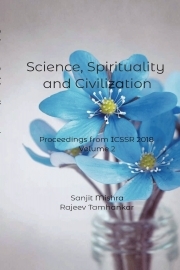 Description of "Science, Spirituality and Civilization Volume 2"
This book contains select papers and essays presented at ICSSC 2018. Sanjit Mishra (b. 1974) has had his higher education in English Literature including a Ph D in Indian Writing in English at Banaras Hindu University. Currently, he is an Associate Professor of English & Humanities in the Department of Applied Science & Engg at Indian Institute of Technology Roorkee. His academic interests include Modern writings and Arts, Literary Theories, Environment writings, Sports writings, Management in Literature among others. Rajeev Tamhankar (b.1989) is IIT Roorkee Silver Medalist, ex-Flipkart, Xiaomi, author of Get Corporated before you get fired, columnist at The New Indian Express, and founder and CEO of TBS Planet Comics. He also holds Limca World Record 2011 for hand-drawing world's largest political map. His research interests include mythology, comics and science. Reviews of "Science, Spirituality and Civilization Volume 2"